Each subscriber preference you setup in WordFly can have a description display below on the subscribe and unsubscribe pages. Since preferences are data fields in WordFly, you will go to Subscribers > Data Fields to add descriptions to your preferences. After you've added your preferences in Account > Preferences, you'll check the box for Show description for preferences. 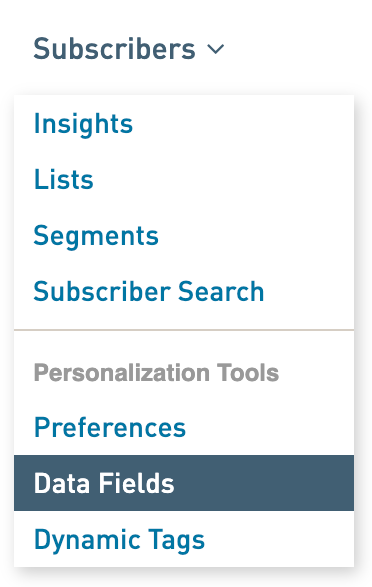 Then you'll add descriptions to preferences under Subscribers > Data Fields. 3. Check the box for Show descriptions for preferences. 2. Find the preference you'd like to update. Filter by the Preference column. Any data field that is a preference will have a dot by it. 3. Click the preference name and then select View/Edit. This will take you into an editing window to edit the preference. 4. Enter your text in the Description field. Refresh your subscribe and unsubscribe landing pages to confirm preference descriptions are displaying.